This article is about the women's association football tournament. For the men's tournament, see FIFA World Cup. Under the tournament's current format, national teams vie for 23 slots in a three-year qualification phase. (The host nation's team is automatically entered as the 24th slot.) The tournament proper, alternatively called the World Cup Finals, is contested at venues within the host nation(s) over a period of about one month. The seven FIFA Women's World Cup tournaments have been won by 4 national teams. The current champion is the United States, after winning their third title in the 2015 tournament. In 1971 an unofficial tournament was held in Mexico. In 1988 – 58 years after the first Men's FIFA World Cup tournament in 1930 and approximately 17 years after the FA ban on women's football was eliminated in 1971 – FIFA hosted an invitational in China as a test to see if a global women's World Cup was feasible. Twelve national teams took part in the competition – four from UEFA, three from AFC, two from CONCACAF and one each from CONMEBOL, CAF and OFC. The tournament saw European champion Norway defeat Sweden 1–0 in the final to win the tournament, while Brazil clinched third place by beating the hosts in a penalty shootout. The competition was deemed a success and on 30 June FIFA approved the establishment of an official World Cup, which was to take place in 1991 again in China. Again, twelve teams competed, this time culminating in the United States beating Norway in the final 2-1. In the 1999 edition, one of the most famous moments of the tournament was American defender Brandi Chastain's victory celebration after scoring the Cup-winning penalty kick against China. She took off her jersey and waved it over her head (as men frequently do), showing her muscular torso and sports bra as she celebrated. The 1999 final in the Rose Bowl in Pasadena, California had an attendance of 90,185, a world record for a women's sporting event. The 1999 and 2003 Women's World Cups were both held in the United States; in 2003 China was supposed to host it, but the tournament was moved because of SARS. As compensation, China retained its automatic qualification to the 2003 tournament as host nation, and was automatically chosen to host the 2007 FIFA Women's World Cup. Germany hosted the 2011 FIFA Women's World Cup, as decided by vote in October 2007. 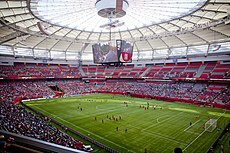 In March 2011, FIFA awarded Canada the right to host the 2015 FIFA Women's World Cup. The 2015 edition saw the field expand from 16 to 24 teams. During the 2015 FIFA Women's World Cup, both Formiga of Brazil and Homare Sawa of Japan made a record of appearing in six World Cups, a feat that had never been achieved before by either female or male players. Christie Rampone is the oldest player to ever play in a Women's World Cup match, at the age of 40 years. In March 2015, FIFA awarded France the right to host the 2019 FIFA Women's World Cup over South Korea. The tournament will begin on 7 June 2019 and the final will be played on 7 July 2019; the final match will be played at Parc Olympique Lyonnais, a venue with a capacity of 58,000 in the Lyon suburb of Décines. The Official Trophy includes a plate at the base bearing the engraved year and name of each FIFA Women's World Cup™ champion. It was designed by William Sawaya and hand-crafted by Milanese specialists Sawaya & Moroni for the 1999 tournament, in the form of a spiral band, enclosing a football at the top, that aims to capture the athleticism, dynamism and elegance of international women's football. In the 2010s, it was fitted with a cone-shaped base. Underneath the base, the name of each of the tournament's previous winners is engraved. The Official Trophy is nearly 18 inches tall and is made of sterling silver clad in 23-karat yellow and white gold, with an estimated value in 2015 of approximately $30,000. By contrast, the men's World Cup trophy is fabricated in 18-karat gold and has a precious metal value of $150,000. However, a new Winner's Trophy is constructed for each women's champion to take home, while there is only one original men's trophy. Qualifying tournaments are held within the six FIFA continental zones (Africa, Asia, North and Central America and Caribbean, South America, Oceania, Europe), and are organised by their respective confederations: Confederation of African Football (CAF), Asian Football Confederation (AFC), Confederation of North, Central America and Caribbean Association Football (CONCACAF), South American Football Confederation CONMEBOL, Oceania Football Confederation (OFC), and Union of European Football Associations (UEFA). For each tournament, FIFA decides beforehand the number of berths awarded to each of the continental zones, based on the relative strength of the confederations' teams. The hosts of the World Cup receive an automatic berth in the finals. Since the 2015 FIFA Women's World Cup, the number of finalists increased from 16 to 24. In the group stage, teams are drawn into groups of four teams each. Each group plays a round-robin tournament, in which each team is scheduled for three matches against other teams in the same group. The last round of matches of each group is scheduled at the same time to preserve fairness among all four teams. In the 2015 24-team format, the two teams finishing first and second in each group and the four best teams among those ranked third qualify for the round of 16, also called the knockout stage. Points are used to rank the teams within a group. Since 1994, three points have been awarded for a win, one for a draw and none for a loss (before, winners received two points). The knockout stage is a single-elimination tournament in which teams play each other in one-off matches, with extra time and penalty shootouts used to decide the winner if necessary. It begins with the round of 16. This is followed by the quarter-finals, semi-finals, the third-place match (contested by the losing semi-finalists), and the final. As per statistical convention in football, matches decided in extra time are counted as wins and losses, while matches decided by penalty shoot-outs are counted as draws. 3 points per win, 1 point per draw and 0 points per loss. The table is accurate as of the end of the 2015 FIFA Women's World Cup. Teams in bold are part of the 2019 FIFA Women's World Cup. The 2003 Women's World Cup was originally scheduled for China but re-located in May 2003 to the United States after a SARS outbreak in China. The 2015 FIFA Women's World Cup set a new attendance record for all previous FIFA competitions other than the men's FIFA World Cup. As of 2017[update], the 2015 FIFA Women's World Cup Final was the most watched soccer match in American history with nearly 23 million viewers, more than the 2015 NBA Finals and Stanley Cup. It was also the most watched Spanish-language broadcast in tournament history. More than 750 million viewers were reported to have watched the tournament worldwide. The Golden Ball for the best player, determined by a vote of media members (first awarded in 1991); the Silver Ball and the Bronze Ball are awarded to the players finishing second and third in the voting respectively. The Golden Boot (also known as the Golden Shoe) for the top goalscorer (first awarded in 1991). The Silver Boot and the Bronze Boot have been awarded to the second and third top goalscorers respectively. The Golden Glove Award for the best goalkeeper, decided by the FIFA Technical Study Group. First awarded in 2007 as "Best Goalkeeper"; current award name adopted in 2011. The Best Young Player Award for the best player no older than age 21 as of 1 January of the year of the final tournament, decided by the FIFA Technical Study Group (first awarded in 2011). The FIFA Fair Play Award for the team with the best record of fair play, according to the points system and criteria established by the FIFA Fair Play Committee (first awarded in 1991). The All-Star Team, consisting of the best players of the tournament as determined by the FIFA Technical Study Group (first selected in 1999). The Dream Team, consisting of the best players of the tournament as chosen by users of fifa.com (first selected in 2015). The Goal of the Tournament, consisting of the tournament's best goal, as chosen by users of fifa.com from a shortlist of 12 goals selected by FIFA's web administrators (first awarded in 2015). The Most Entertaining Team Award for the team that has entertained the public the most during the World Cup, determined by a poll of the general public (awarded in 2003 and 2007). Formiga and Homare Sawa are the only players to appear in six Women's World Cup editions. ^ "The History of Women's Football". England Football Association. Retrieved 3 October 2016. ^ Koppel, Naomi (3 May 2003). "FIFA moves Women's World Cup from China because of SARS". USA Today. Retrieved 27 March 2007. ^ Molinaro, John F. (3 March 2011). "Canada gets 2015 Women's World Cup of soccer". CBC Sports. Retrieved 9 May 2011. ^ "Japan legend Sawa makes cut for sixth World Cup". Reuters. 1 May 2015. ^ "USWNT'S Christie Rampone Is Now The Oldest Player To Appear In The Women's World Cup". Huffington Post. 17 June 2015. ^ "France to host the FIFA Women's World Cup in 2019". FIFA.com. 19 March 2015. ^ "LA FINALE DU MONDIAL FEMININ 2019 AU PARC OL !" (Press release) (in French). Groupama Stadium. 15 June 2016. ^ SENTURK, AYDIN; BASKAYA, Gizem (31 August 2017). "Performance analysis of 2015 FIFA Women's World Cup Champion USA National Team". Turkish Journal of Sport and Exercise: 196–201. doi:10.15314/tsed.288361. ISSN 2147-5652. ^ "The Official Womens World Cup Trophy". www.fifa.com. Retrieved 2 October 2018. ^ "Women's World Cup Trophy Is Made of Gold-Clad Sterling Silver; Men's Version Is 18-Karat Gold". The Jeweler's Blog. 5 July 2015. Retrieved 13 October 2018. ^ "World Champions: USA Wins 2015 FIFA Women's World Cup". U.S. Soccer. 5 July 2004. Retrieved 27 June 2017. ^ a b c "Regulations FIFA Women's World Cup Canada 2015" (PDF). FIFA.com. Fédération Internationale de Football Association. Retrieved 12 June 2015. ^ "Brazil takes third". SI/CNN. 10 July 1999. Archived from the original on 28 February 2002. Retrieved 2 July 2011. ^ a b c d e f "FIFA Women's World Cup Germany 2011" (PDF). FIFA. pp. 109–110. Retrieved 3 October 2016. ^ "FIFA Women's World Cup Germany 2011 Statistics". FIFA. Retrieved 3 October 2016. ^ a b "Key figures from the FIFA Women's World Cup Canada 2015™". FIFA. 7 July 2015. Retrieved 3 October 2016. ^ a b "Women's World Cup Final Is Most-watched Soccer Match in U.S. History". U.S. Soccer. 8 July 2015. Retrieved 27 June 2017. ^ Hinog, Mark (6 July 2015). "More Americans watched the Women's World Cup final than the NBA Finals or the Stanley Cup 24". SB Nation. Retrieved 27 June 2017. ^ "Record-breaking FIFA Women's World Cup tops 750 million TV viewers". FIFA. 17 December 2015. Retrieved 27 June 2017. Wikimedia Commons has media related to FIFA Women's World Cup.